A religious baby shower celebrates the upcoming or recent arrival of an expectant mom's bundle of joy. Look for decorations that fit with mom's beliefs that are also appropriate for the occasion. Confetti: Sprinkle confetti around centerpieces or down a table runner. The angel confetti and silver and gold cross confetti from Chico Party are good options for any shower. Centerpieces: Look for religious centerpieces that work for either a boy or girl's shower. The blessed baby centerpiece from Parties 4 Kids is both blue and pink, with a message about the child being "heaven sent." Sprays also make lovely centerpieces - the set of 12 from Century Novelty feature pink and blue hearts with a white cross in the center. Chair decorations: Pick up a strand of ribbon with a religious graphic printed on it, and tie it around chairs, forming a large bow in the back. Pick out a wide ribbon and use the religious words tape from Lion Ribbons in the center of the ribbons to turn ordinary bows into religiously appropriate ones for a shower. The Jesus loves me ribbon from Hobby Lobby would be a good choice for small accents on vases or to use for hanging crosses and other items. Balloons: Accent any area with balloons, whether you hang them or place them on the table. For a bright and cheery shower, pick up the cross or sweet blessings balloons from Oriental Trading. 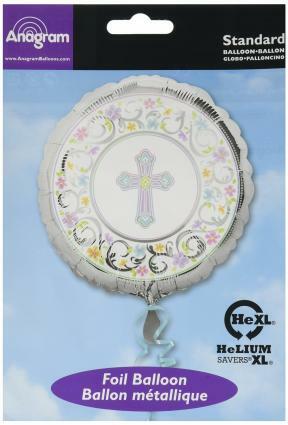 If pastels fit the rest of the decorations best, check out the blessed day foil balloon from Amazon with flourishes of silver, pastel pink, blue, purple, and yellow, and a cross in the center. Banners: A banner welcoming the new arrival is perfect for a shower hosted after the child has been born. Hang one inside, above the food or gift table, or greet guests outside with a banner on the porch or front door. Pick up the blessings banner for either a boy or girl at ShinDigz and can be personalized with any message you desire in a variety of sizes. Decorative items: A larger decoration item for the home is a lovely gift plus decoration in one. The angel wings wall décor from Amazon not only looks lovely at a shower featuring the winged creatures, but will also be beautiful in any baby's room. Ceiling hangings: The space above the party area and food table should also be decorated. WrapWithUs.com offers cross swirl decorations for a gender neutral shower, or the pink or blue cross honeycomb trimmers if you want to highlight a special baby boy or girl's arrival. Hanging cross decorations from Century Novelty in silver and gold are also a good choice for gender neutral showers. Rainbows: Hang a rainbow cutout from Windy City Novelties on the wall above the food and gift tables. Add rainbow colored fluffy decorations from Party City to the ceiling for an added pop of color. Animals: Set stuffed animals in pairs throughout the party space. Include several large animal-shaped balloons from The Jungle Store, in shapes like tigers, zebras, monkeys, and birds, to add additional festivity to the party space. Arks: Represent the ark by using small Noah's Ark shaped candles from Amazon along a table runner. Kmart has a Noah's Ark wall decal that can be hung on the wall and then gifted to baby's mom after the shower. If the shower is held after the baby's born, pick up a few ark-shaped frames like the Malden frame from Amazon, and put newborn photos in it on tables. In addition to the items listed above, you can also find themed supplies and decorations that all match. 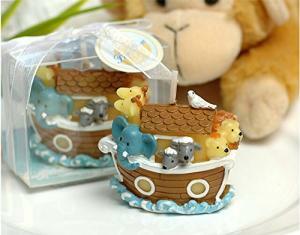 Check out the Noah's Ark shower themed items from Baby Shower Stuff.com. 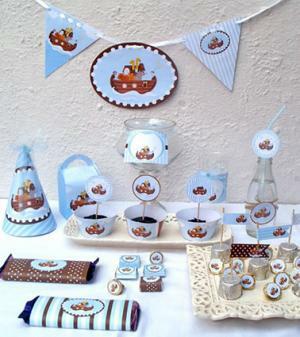 Centerpieces: Look for centerpieces like the baby moments one available at Hard To Find Party Supplies. Precious Moments centerpieces may also be available at discount or party outlet stores. 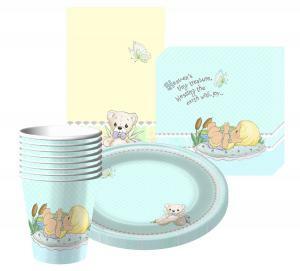 Party decoration set (8): Make your decorating simple by purchasing one or more sets of Precious Moments baby shower place settings for a fully coordinated look. Pastel decorations: Precious Moments figurines are done in soft pastel colors like baby blue, mint green, and pink. It can be difficult to find the actual branded Precious Moments decorations, so look for pastel decorations to finish out your scheme. Paper lanterns from the Hanging Latern Company are available in pink, periwinkle, lilac, and light blue; pastel balloons are available from Party Supplies Delivered; and crepe paper streamers in pastel colors are available at discount stores like the 99¢ Online Discount Stores, as well as in local party supply shops and big box retailers. Wings: Angel wings can be purchased as part of Halloween, Christmas, or dress-up costumes. Find white glitter wings at Century Novelty and hang them on walls or the ceiling. Harps: Angels are often depicted playing harps, so look for plastic ones you can hang up throughout your area. The gold harp from HalloweenCostumes might just fit the bill. Tulle with lights: Pick up white tulle from a fabric shop like JoAnn's and cover white light strands from Save-on-Crafts with the tulle to create an etheral lighting effect. You can also find decorations and supplies that are themed and grouped together in party supply retailers, like the Little Angel Baby Shower items available at Parties 4 Kids. Honor the mom-to-be's faith by hosting a shower that showers her upcoming or newborn bundle in God's love. A religious shower will look heavenly with a few decorative touches that fit the occasion.